I'm doing so much better today. Went to my weight watcher meeting this morning. I'm up a pound but it's no shock. With all the holiday stuff, and being stressed out it's amazing I'm not up 10 pounds. We had a substitute leader today but she was excellent. It was the motivational shot in the arm I needed this morning. I didn't want to go in the first place because I knew I was up, but at the same time I knew it was the right thing to do. Yesterday I started making wise choices again. 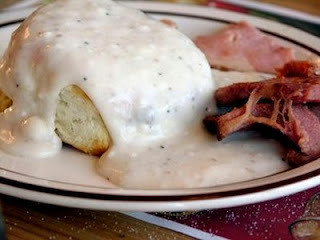 When we went to breakfast yesterday I had ordered my favorites which are biscuits and gravy and all that stuff. I was stressed, had just had a crying jag and really, it's what I wanted. I ordered it. Then sat there and thought, "WHY AM I COMPOUNDING THIS PROBLEM? THESE BISCUITS AND GRAVY ARE GOING TO SOLVE NOTHING. STOP THE INSANITY!" I called the server back over and said, "I'm so sorry to do this to you, but I had momentarily lost my mind. Please forgive me. I need to reorder my food." I proceeded to order pancakes with low calorie butter and low calorie syrup, and two turkey sausages, with an unsweetened tea. I regained my presence of mind. Stopped the brain warp. Started being a good friend to myself again. It also helped today that my devotional reading spoke perfectly to so many things in my life. My day was started on a such a motivational note between my WW meeting and then my devotions...both put me in the right frame of mind - focusing on what God wants me to focus on. I'll blog about the devotional under a separate post. I believe it will speak to many of you who might be struggling. Today we have just been working non-stop to get everything done so we can move at a slower pace Christmas week and spend some time with the kids. The week between Christmas and New Years Day, Larry closes the office and we only come in for "essentials" - services, bank deposits, etc., and also handling emergencies such as hospitalizations, etc. Aside from that we work hard the week before to get everything prepared so we don't have office work. It takes working at a breakneck pace the week before. We're getting it done. We're going to have some family time.